360 degree ventilation design - It’s unique feature of this printer. Cooling and ventilation is the most important part of 3D printer designing to get the best quality printing. 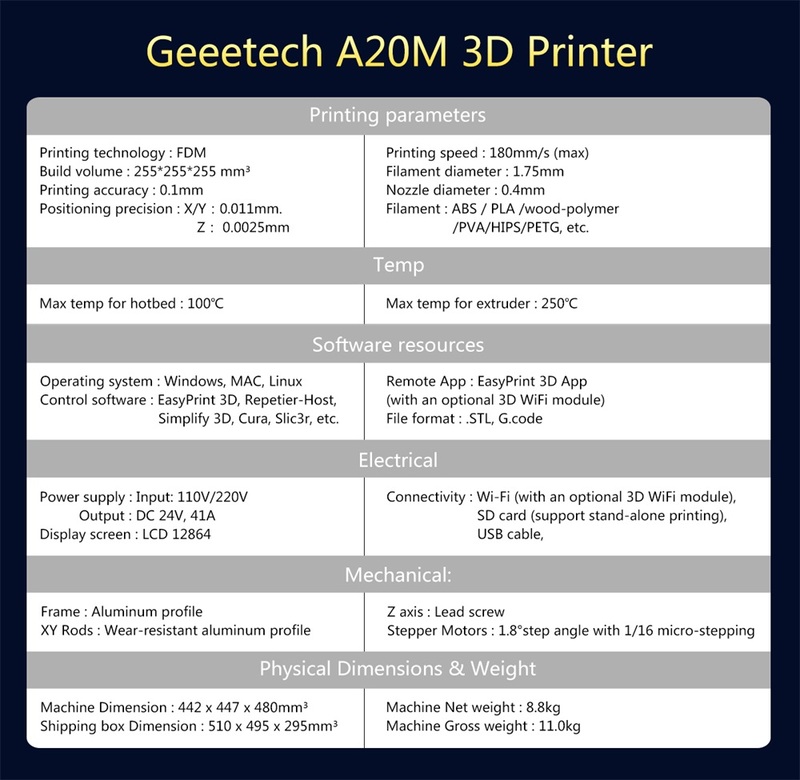 Geeetech adopted 360-degree ventilation means the extruder will cool at all around, ensures perfect heat dissipation, and quality 3d printing. High-performance gear train - The smooth movement at different axis and perfect torque ration ensures high quality printing, you know. A20M extruder motor uses 3:1 ratio gear train which ensures accurate torque input and ensures precision printing. Good Adhesive print surface coating Means once the bed get heat uniformly, it makes easy to remove the printed model just like removing a piece of cake. All of the electronics are housed in the base- A20M came with one box as its base, inside the box they mounted everything the control box, the display, the switch and everything. The base box enhanced the overall look and beauty of this awesome 3D printer. A20M control board supports auto-leveling, Auto leveling sensor is Optional upgrade. No need for time-consuming manual bed leveling. I bought an A20M too and love it so far.I had best mixing success with transparent and translucent filament. Interesting machine. Build part QC of this machine was spot-on. Not one single issue everything fit precisely and exactly the way it should . I was very much impressed by Solid Metal box. Frame is more solid & rigid. heard almost no noise when its printing. Output results are excellent.